EASTER HOPE: Sisters Tralen, Raclen and Breann Garcia hammed it up for the camera at the Angel Tree Easter Celebration hosted by New Hope Christian Fellowship at Sand Island State Recreational Area yesterday. The public and children of incarcerated parents were invited to the event with entertainment, bouncers, games, food and giveaways. 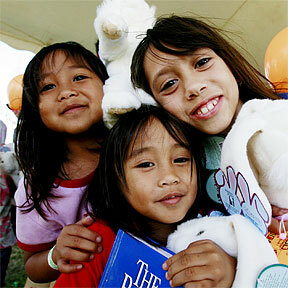 Last-minute gifts let Kawaiahao Church continue providing meals and shelter. Administrators cite unreimbursed care at Straub and Kapiolani. An integral part of daily life until 1820, hula was restricted for 76 years. UH's fringe players made their final plea for playing time in yesterday's spring scrimmage. Six weeks of storms pound home a hard lesson. A 12-page Star-Bulletin special section. Cancun: The historically significant city is a luxurious getaway with its beautiful waters. A husband and wife paddle upstream to open a sports lifestyle store at Ward Gateway Center. Hawaii places a heavier income tax burden on the working poor than any other state.